It’s just a big rock in the ground, isn’t it? Kata Tjuta (also known as Mount Olga), Uluru (Ayers Rock) and Kings Canyon in Australia’s Northern Territory make a trio of outstanding geological and indigenous spiritual and cultural icons set against the unspoilt red earth of the outback. The former two, about 450 km from Alice Springs, itself an extremity of remoteness, are not easy to reach by land. Choosing my outback tour carefully – I did not want to be with either student backpackers or middle class grey wanderers, I opted for a physically challenging but relatively expensive tour. There were nine of us plus our guide, crammed into a non-air conditioned Land Rover. On each leg of the journey one lucky person got to sit up front with the guide and benefit from such cooling drafts that forty degree air could achieve through the window. In the back we just sweated and bumped along. At first it was most uncomfortable, the physical proximity to strangers and the sheer jammed-in-ness. After half a day, however, the group gelled, no longer defending our individual space but accommodating and adjusting to the whole, and comfortable in our own and shared grime. First stop was Uluru in the late afernoon. We were advised against attempting to climb it- on grounds of safety and respect for the aboriginal peoples for whom it is sacred. it’s just a big rock in the ground, isn’t? No, it’s a monolith and it’s massive, with its own otherworldly mystical ambience. It takes a couple of hours at a decent pace to walk around. I fell in step with a former Formula One racing car engineer and we chatted easily as we struggled round in the heat, taking turns to swipe the legions of flies crawling over our backs. Note: this trip is not for everyone, and bring a fly net. 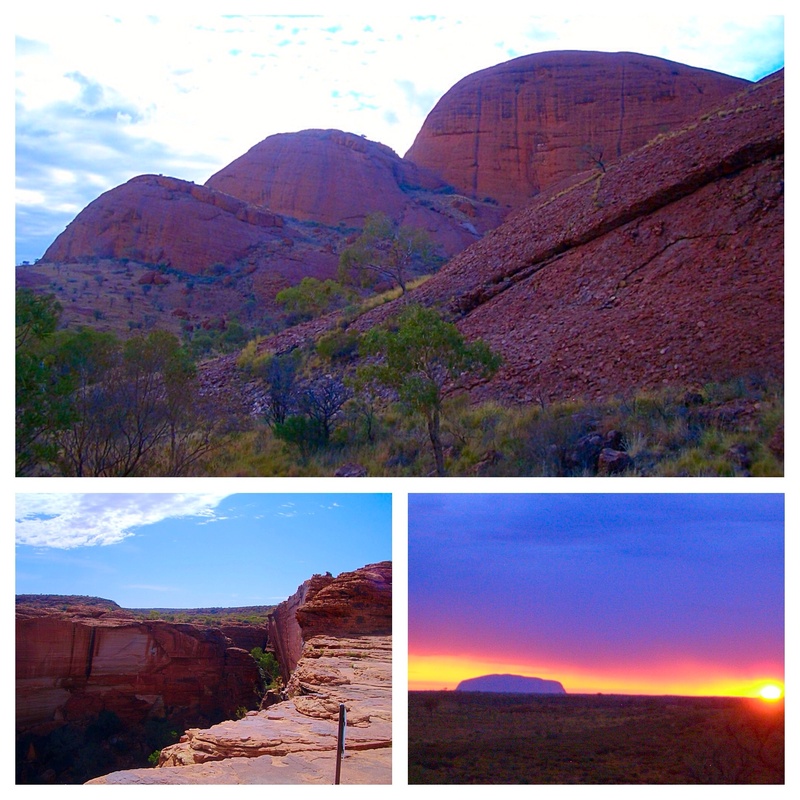 We got to watch both sunset and sunrise over the Rock, camping out in swags (outdoor canvas sleeping bags) between. Then the quick hop to Kata Tjuta. Less well known, but equally, if not more, impressive, this series of giant rock formations or bornhardts is an oasis of flora and eucalypts. My lasting impression is the bitter-sweet fragrance of the air, refreshing despite the heat. For the comfort- loving tourist, don’t despair. There is the Ayers Rock resort and airport and you can visit the sights by luxury coach. We dropped by for provisions – mainly isotonic drinks to replenish our impaired hydration and electrolyte balance- at the shop. Beautifully manicured lawns and gardens and people- fragrant smelling and clean, our grimy platoon would have appeared unkempt and repulsive. Indeed we felt that way, but wore it as a badge of honour. Another 300 km to Kings Canyon– a spectacular gorge with hidden pools where you can swim, then the same distance back to Alice via another night under the stars. You get the picture- Australia is big. This time Alice Springs seemed like a cultured metropolis and a final evening was spent in the pub, dining and reminiscing. I’ve been thinking of the Australian wilderness recently too – Such an incredible landscape. yes! so much of it to see still. Love the colors!!! Wow! Can’t to visit there and capture images like that!!! Thanks for sharing! Got me right into the Red Centre. Awesome!